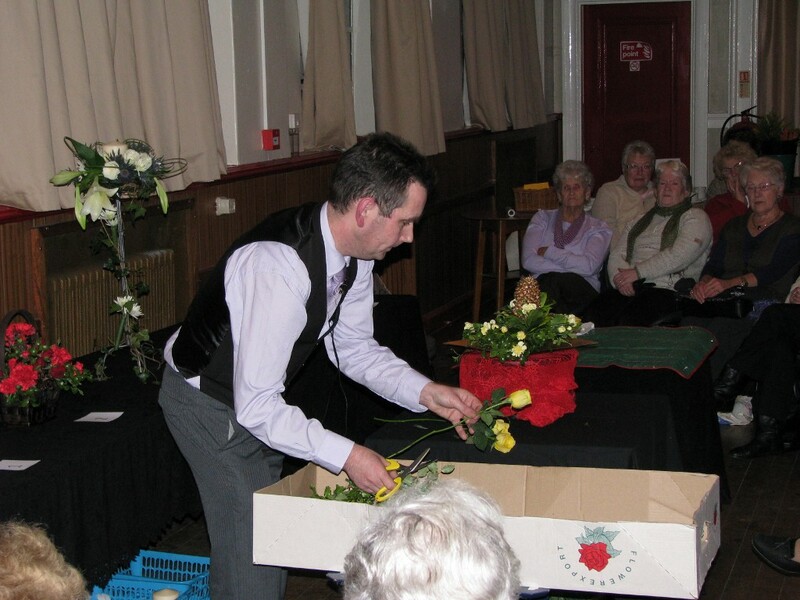 Christmas arrived early at the November evening talk at Tiverton Garden Club when Chairman, Tim Nichols and committee member Maggie Roberts demonstrated some Christmas flower arranging. A huge audience enjoyed watching Maggie's first modern arrangement using a goldfish bowl, some water crystal gel and some battery operated lights with some orange flowers followed by Tim's basket arrangement using traditional red colours and some baubles. For Maggie's second arrangement she used a metal stand and some white lillies and roses and blue sea holly with a white candle and Tim did a table arrangement on a gold charger with a gold candle and yellow flowers. For Maggie's third arrangement, she used a metal frame with a square mesh and brighly coloured flowers to create a collage using wool as well as foliage and flowers. Tim's third arrangement used a metal frame in the same of a tree with four candles. He decorated a interlocking wreath ring with white carnations, roses and chrysanthemums. The arrangement were then raffled which 6 luck members of the audience won. For the October garden visit, members visited The House of Marbles for a refreshments on the way to the south Devon garden of Lukesland near Ivybridge. Lukesland lies on the edge of Dartmoor in a small valley with a brook cascading from its source through ponds and over waterfalls into the River Erme. The mainly woodland garden has flowering shrubs, trees and lots of wildlife. Members enjoyed a sunny autumnal day and home made cakes in the tea room. At the October meeting, the guest speakers were Michelle & Eric Heard who run Cheristow Lavendar Farm near Hartland, north Devon. They gave members a hands on demonstration and talk of how to cultivate, grow and explain the uses of lavendar. They expalined how they had developed their farm over the last few years and is now open to the public along with a little tea room serving interesting receipe combinations of preserves and cakes made with lavendar. Apologises for the gap in posting information. I will endeavour to bring the blog up to date as soon as possible.